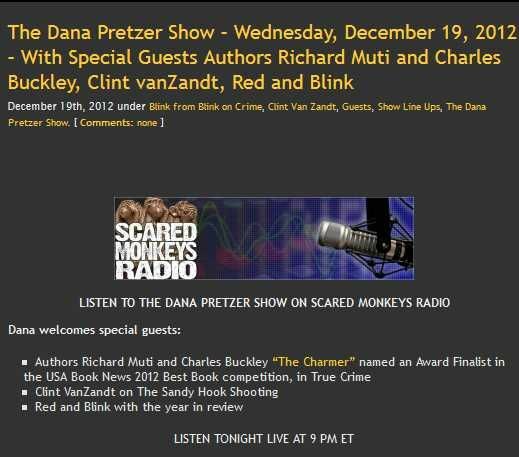 S. Christina Stoy, “Blink” , Editor In Chief of www.blinkoncrime.com and “Red”, owner of www.scaredmonkeys.com discuss the Year’s political and true crime cases on THE DANA PRETZER SHOW with host Dana Pretzer. As many of you know, my Mother has spent the last seven years battling lung cancer and subsequent secondary metastasis throughout her body. She quit smoking in 1986. With an initial classification of stage 3B and a bleak prognosis , she endured herculean efforts to wage war against the silent enemy that only showed itself on PET scans. She was an avid true crime reader and case follower. In her last email to me, she reviewed my work in the case against Jerry Sandusky while lying in Oncology Intensive Care via her Blackberry that she smuggled in under her gown. After three weeks of heinousness, she died peacefully Tuesday at the age of 63. When she passed, she had 5 books on her nightstand and her Kindle; one of which I was sent by it’s authors for future review. She told me she was willing to read it, but she was not going to do my job for me, LOL. Our Mom’s tenacity for knowledge was secondary to her sense of humor. Last week when we brought her home I reminded her that the same things about her personality that kept her alive for seven years against all odds were going to work against her desire to take her last nap. 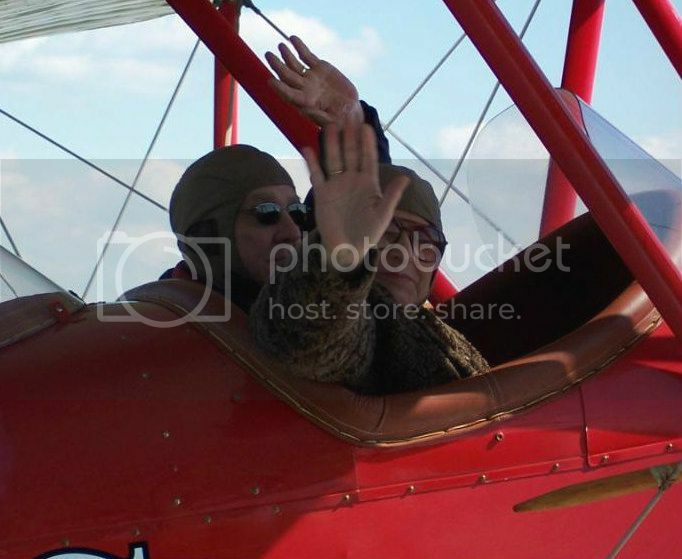 She responded, ” I know honey, I am dragging my parachute.” As the Olympics began, I told her she got the gold medal for outliving all the other patients in the oncology practice and with only one lung category. “Then use the new one you bought me. Your Father’s are flat and mushy and I cannot get him to part with them, OR ME, ba dump bump” , she said complete with hand gestures mimicking a drum set. There was nothing secondary about her love of our Father, her girls or our entire family. In the nearly 44 years they were married, I never once saw them argue. As kids, that was particularly daunting- we got away with nothing. The parental divide and conquer plan was non-existent in our home. In my teens I used to be annoyed by her ability to walk into the middle of some early crime show and know exactly who did it and why. A N N O Y I N G in the learning process. E N D E A R I N G in the saying goodbye process. Little did I know then- I would also be inspired by it. I know everyone says they have the greatest Mum in the world, but she truly was the best woman I have ever known. Ma Mere did not go gently into the good night. She told the good night she would come when she was ready, and that she did. I will not be keeping this post up for long, this site and my work are dedicated to true crime. While losing one’s Mother at 63 is very much a crime of sorts to me, we had the ability to spend our borrowed time together creating memories that will sustain us during the most profound loss I have ever experienced- many victims families of cases we cover do not. Frankly, as far as learning curves go, I have a new perspective on grief so I appreciate you indulging me with this announcement for a bit. I will be back in full swing next week, moderating until then. My sincere thanks to all for your continued support at www.blinkoncrime.com, www.scaredmonkeys.com and www.scaredmonkeys.net. I would also like to thank Hematology-Oncology Associates Dr. Friedman and Dr. Shaw. You were her care consultants operating with her directives, and your advice and compassion allowed us to bring her home. I get that it is weird with 27 years in the business you come across the raging bull dressed like my 5′ 3″ tall Mother. The energy you gave us at your surprise and delight to have her be a first in your practice is cherished and Thank You. Special Guest, RED, featured political columnist and owner of www.scaredmonkeys.com at 9:50 PM. April 1 2011- Successful prosecution and life sentence of James Hattaway. No April Fools joke. Hattaway, a suspect in the disappearances of Onda Chris George, and Tracy Ocasio, was convicted of attempted murder of Rachael Clark . May- Terrorist leader Osama bin Laden is executed upon refusal to surrender by US Navy Seals. May/July- The trial of Casey Anthony resulting in her acquittal in all changes except 4 counts of lying to police. Ms. Anthony has been renamed the C-word by www.blinkoncrime.com and recently released her first video diary as a blonde with a really bad cut. June- Disappearance of Jacque Waller, wife of former cop and general con man Clay Waller. Jacque has not been recovered, but Clay is in prison on unrelated charges currently and the couple’s children are in the custody of Jacque’s family. According to Clay’s dad , he has already confessed to her murder. June -Successful prosecution resulting in a life sentence for the murder of Christine Sheddy, a 5 part cold case series developed in 2010 and featured on BOC for the purposes of progressing her case. Justen Hadel, one of the primary suspects in the case ending up confessing, and our information was correct that Christine was murdered on the Byrd road property. I spent a day on in 105 degree weather followed by a mini-hurricane on this hell-hole property I will never forget. I continue to seek justice in the hope a prosecution will follow for Clarence Jackson and Tia. July/August 2011- Celina Cass missing, and recovery of her remains. While it is presumed a homicide, her cause of death has not been determined or released. Wendell Noyes, her stepfather is the only non-official person of interest. Celina’s mother left him while he underwent psychiatric care upon the news of Celina’s recovery. It is my solid opinion that Wendell is involved in Celina’s death and disposal of her remains in a water treatment (). There have been no arrests or indictments in this case to date. August 19, 2011. West Memphis Three- Two days after I wrote a series about the murders of 3 8 year old boys in June of 1993 by 3 teenage boys known as the West Memphis Three, all three plead guilty to an alford plea after the state agreed to a deal proffered by the defense team, funded by the Hollywood elite. So far, Reese Witherspoon has been cast as Pam Hobbs, mother of Stevie Branch. In November, the parents wrote a letter to the Chair of the AMPAS documentary committee asking that they not con sider the HBO commissioned Paradise Lost 3, Purgatory for an award. We featured the entire letter as a front page on the site, in support. October 2011- The disappearance of Karen Swift, mother of four. Karen was located on December (), and has yet to have her autopsy completed or her remains released. Sheriff Box of the Dyer County Sheriffs Office has not named a suspect, but it is widely known that the primary person of interest is David Swift, Karen’s recently estranged husband. Missing 10 month old Lisa Irwin- No new anything in this case, since Joe Tacopina of Joran VanDerSloot fame took the case to represent the parents. A lead developed from Deb Bradley’s phone produced a juggalo chic whose phone was called in what is believed to be in the middle of the alleged crime, and did ping close to the Irwin residence. Megan Wright’s former boyfriend known as Jersey was subsequently arrested for tampering with a vehicle. She claims not to know anything in the case and that her phone was used by several members of a household she was since asked to leave. Amanda Knox Acquittal- what many did not know about the prosecutor will change most of your opinions in this case. Blink dubs Giuliano Mignini “The Mike Nifong” of Perusia. Over 40 counts of child sexual abuse are filed in an indictment against former PSU offensive coordinator and Second Mile founder Jerry Sandusky. Tim Curley and Gary Schwartz are indicted and held for trial for perjury in their grand jury testimony. Mike McQueary stands firm in his testimony during the preliminary hearing. Blink uncovers a possible insurance scandal paying the legal bills. Orlando, FL- The Ninth Circuit of Orange County is beginning to look like their own decay facility. If your watching the murder trial of Casey Anthony, for the murder of her daughter Caylee as the defense is presenting their case in chief, you are watching Jose Baez et al building their own THE BODY FARM, of defense witnesses, that is. For those of you who wish to maintain your decorum and have been advised to remove sharp objects from your reach, I offer the Blink hilight reel. Dr. Timothy Huntington, who was the defense entymologist expert , swarmed in, stating that the flies and larvae were attracted to the contents of the trash bag. In short, his opinion was the blowflies, known for their ability to smell “happy hour” within seconds, were nearly absent from the trunk, and that the ones found were attracted to whatever decomposing food products, or garbage, that were NOT present. Yep, I said NOT present. Jeff Ashton opened the evidence of the soda can reflecting no chew spit, and the “salami” packaging which actually held a piece of paper disguised as a food item, apparently. Dr. Huntington’s “pigs not in blankets” experiment, where he had someone kill pigs and stash them in the trunks of various cars to prove the rate and amount of blowflies present in contrast to those found in the trunk of the Pontiac Sunfire, forgot to duplicate conditions in anyway, specifically, double trash bags wrapped in a laundry bag. Dr. Huntington was forced to admit he has zero relevant experience in this area. Like a moth to the flame, State Attorney Jeff Ashton drew Huntington into his “web of truth”. Huntington, for purposes of this piece, was not at all comfortable on the prosecutorial flypaper; he said it “rides up” after a while. It is not known if Dr. Huntington left any puparia in his seat when he was excused from the witness box. William Rodriguez, Phd, the defense expert in taphonomy, or the study of decaying organisms over time through fossilization has an impressive resume. flounder (v)- to make clumsy attempts to regain one’s balance. 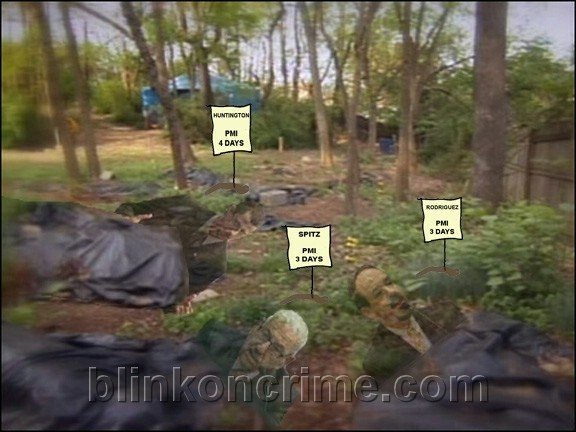 The good Dr, under oath, claimed to be a co-founder of infamous THE BODY FARM in open court. Not according to THE BODY FARM, or it’s actual founder, Dr. Bill Bass. Dr. Rodriguez was already a subject of contention, or possible contEMPTion, for drastically altering the opinion and findings he reported, versus what he is now prepared to testify to, thus violating Judge Perry’s order for what is now going to be the third time. However, it is a whole different animal to claim a co-founder status, than the actuality, which was a teaching assistant, and at times, window washer. Because the State of Florida believes Rodriguez’s change in testimony is in effect a discovery violation, Judge Perry has since reserved ruling on the infraction until the trial’s conclusion. Wait till he hears this BOMBSHELL. By far, one of the more painful witness cross-examinations to date, Werner Spitz, MD, was like flying coach to Thailand seated next to a newborn with an ear infection, that has run out of booze in the first hour. Dr. Spitz’s obsession with his pocket-cranial saw for all occasions not withstanding, his testimony under cross, following a celebrated 56 year forensic pathology career involving the Assasinations of President JFK and Dr. Martin Luther King was an affront to the profession, period. At one point, he referred to the autopsy conducted by Jan Garavaglia, of “Dr. G” fame, as “shoddy” because she did not remove the “cap” of the skull, and therefore could not see the brain; although little Caylee Anthony’s remains were completely skeletonized with no soft tissue whatsoever. When Dr. Spitz told the jury that he believed that the reason the mandibular bone appeared almost in full articular placement was because the duct tape was placed “on the left side only” after the toddler was completely decomposed, jurors were observed actually smirking at the man. He was unaware there were 3 separate strips of duct tape affixed, and overall seemed to defy most Medico Legal Investigation of Death protocol in unnatural death investigation , which sadly, he is actually the co-author of. Dr. Jane Bock, the defense botany expert, as I have covered exclusively previously, is a lovely woman and accomplished professor. She was also the benefactor of Jeff Ashton’s gentlemanly handling of her testimony during cross examination this afternoon. Dr. Bock went from the sublime to the ridiculous in her assertion that Caylee could have completely skeletonized, and grown herself a “root wrap” via her Pooh blanket. Mr. Ashton was kinder than I would have been, to his credit, and to my “note to self about humility”, because I have written about her prior case work and it would have been entirely relevant as an impeachment item. That said, I will follow his lead. With no personal disrespect intended whatsoever to these “experts”, professionally, you betcha, I have to ask, did Jose Baez pull these folks out of a matinee complete with the AARP discount for a COCOON screening? How is it, these seemingly accomplished, highly educated forensic professionals with career paths the envy of many a grad student, were willing to throw their credentials behind such ludicrous opinions that were completely unsubstantiated by findings or evidence, simply to have their names associated with this case. Make no mistake, that is exactly what happened here. Being an expert defense witness, real or perceived in this case, makes going into one’s twilight a solid 401K extender. Blink discussing witnesses and developments after press-time LIVE tonight on THE DANA PRETZER SHOW. Orlando, FL- I know, everyone was looking for my analysis for the week on some of the most influential forensics evidence and experts to date. You will have to wait. I could simply not let this go. Jose Baez, defense counsel for accused Filicidial frequent fornicator Casey Anthony is concerned his client might be viewed as a lesbian by the jury based on some photos in evidence. I can’t take it. I thought I could, I thought I could keep it objective. I admit it, he is a Barristerific Baffoon Extroirdinaire. This defendant, this woman, with multiple simultaneous male sexual partners, an unknown baby daddy, the prosecution bases it’s case on the fact that she has a new boyfriend she is willing to kill her child over, and this is HIS REACTION? It is maddening what an oaf this guy is with respect to being charged with saving a defendant’s life. Having a jury perceive Casey as a lesbian is like Christmas in June for his client. Not a lot of cases of lesbian-motivated filicide out there, and what is, is likely to be a new suspect for this suspect generating camp. Baez says he has been, but noted that the average age of the jurors is 50 and that some members “would be extremely offended” by the image. This from the business owner turned attorney of the now defunct Brazillian Bikini online store. Blink is LIVE Tonight, Discussing the Casey Anthony Trial on the Dana Pretzer Show, Scared Monkeys Radio. Madeline Tanner, editor, www.blinkoncrime.com contributed to this report.